Located just 15 minutes north of Byron Bay, Mullumbimby calls itself the ‘Biggest Little Town in Australia’. But this ‘little’ town produces one of the best music festivals in Australia annually – the Mullum Music Festival. In its 11th year, the Mullum Music Festival’s 2018 line up features performances from Bombino, Mad Professor, Ben Ottewell, Gordi, Mike Love, Husky, Saint Sister and more. Local, national and international groups and musicians will grace the stages over the four days of the festival, 15-18 November 2018. Tickets are already sold out for Thursday and the gold weekend passes are as well, so if you’re thinking about coming, now is the time to nab your tickets. Tickets cost from $68 per adult for day passes on Friday, to $82 for adult day passes on Saturday and Sunday. There are still Weekend silver and bronze passes available. Holiday visitors to the Byron Bay area during the weekend of 15-18 November should make the short trip to Mullumbimby to enjoy all the awesome music and activities the festival has to offer. This festival may be smaller than some others in Australia, but what it lacks in size it makes up for in the quality of music, venues and amenities. In fact, the Sydney Morning Herald has previously rated the Mullum Music Festival as one of its top five music festivals. The Mullum Music Festival 2018 kicks off with the already sold out Opening Night Gala on Thursday 15 November. But don’t worry, there are lots of other fun special events as well as tons of music to make coming out on Friday, Saturday or Sunday or all weekend long. Spread over venues like the Civic Hall, a high school and a funky bowling club, the music starts at 5 pm on Friday (with the exception of the fun free Farmers Market concert which goes from 10 – 11 am on Friday morning, which will be broadcast live on ABC North Coast) and continues all weekend. Music begins again at 10 am on Saturday (after a yoga class, of course, and several workshops) and then noon (mostly, with the exception of Dao of Dylan, which starts playing at 11:45 am at the Civic Hall) on Sunday. Another not-to-miss aspect of the festival is the Street Parade that begins at 11 am on Sunday and runs from the Council Chambers, outside in the park, to the Civic Hall. The 2018 parade is sponsored by Santos Organic and typically features lots of great music and an array of local musicians. New this year is stand-up comedy, hosted by the Byron Shire Council, that will be performed on Saturday and Sunday in the Council Chambers. In addition, a new venue, Byron School of Arts hosts an art exhibition over the weekend as well as music concerts all weekend. Be sure to check out the full programme of the Mullum Music Festival online for a full listing of workshops, performances and all the events happening over the weekend. 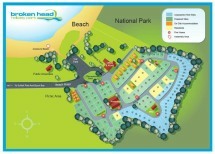 If you want to stay in the area but not right on top of the festival, consider the budget-friendly location of Broken Head Holiday Park. This way you also can enjoy all of what’s on in Byron Bay as well as the Mullum Music Fest. For bus service on Friday and Saturday, use Blanch’s bus service route 640 buses from Byron Bay, Suffolk Park and Mullumbimby River Terrace to head to the festival. Take Route 645 buses from Brunswick Heads to catch a ride to the festival. On Sunday, the festival will offer bus service starting at 10 am. For the return trip, you’ll need to find a festival-operated bus outside the Mullum Civic Hall. It will depart for all the destinations listed above at midnight on Friday and Sunday and 10 pm and midnight on Saturday. In addition to tons of great music, workshops, a nature walk, street parade and even a free concert at Mullum Markets on Saturday, there are a host of great places to eat and things to do. For example, make sure to grab a slice of pizza at Milk and Honey – a local favourite. The Empire Cafe: Burgers are a favourite at this restaurant, but offers options for vegan or gluten free visitors. Spice It Up Thai: Located at one of the venues, the Bowlo, visitors rave about it serving the ‘best regional Thai food’. Diner 55: The new Spice It Up Thaieatery born of the former Poincinana space, Diner 55 serves as the The Festival Club with ticketed events both evenings starting at 6 pm. The casual restaurant serves up American-style food and bar snacks as well as cocktails. A stay at our affordable holiday park in Broken Head translates to more cash flow to enjoy the Mullum Music Festival and what’s on in Byron Bay. Check out our Byron Bay budget accommodation and book now!